Carly Davison 11SMY has achieved the extraordinary level of Black Belt in the ancient Korean martial art of Tae Kwondo. All the training under the instruction of Master Duffy paid off in early October when Carly successfully graded for her black belt in front of a prestigious panel of judges in Falkirk, Scotland. She had to prove herself at Poomsae (patterns), Kyrougi (sparring), Power test (breaking boards) and a written theory exam. 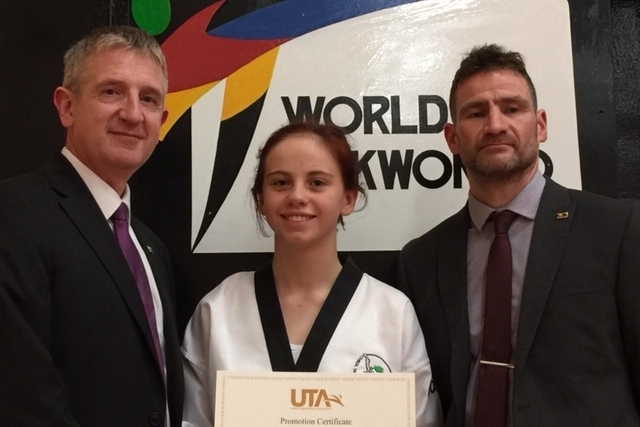 She passed her grading under the highest grading panel in the UK - grandmaster Tong Wong Shin (9th) Dan, grandmaster David Bailey (8th) Dan and masters Johnston and Culbert (7th) Dan. Grandmaster Shin is British Referee director and two times world champion. Posted on October 23, 2018 by Heather Dornan Wilson and filed under Sport and tagged VCB Black Belt Tae Kwondo.